Qannik, found all alone in Alaska at 5 months, is being shipped to her new home. It might be the beginning of summer, but Operation Snowflake is in full effect. Qannik, a 5-month-old polar bear cub found as an orphan on Alaska’s North Slope in April, is being shipped on a UPS Boeing 747-400 from her temporary digs at the Alaska Zoo to the Glacier Run development in the Louisville Zoo in Kentucky. The cub’s name, pronounced “Ken’ick,” means “snowflake” in the Inupiat language — it’s also the name of the gravel pad on the North Slope where Qannik was first seen. And Operation Snowflake has been in the works for two months, with the Alaska Zoo, Louisville Zoo, U.S. Fish and Wildlife Service, Association of Zoos and Aquariums, Polar Bears International and UPS all involved. But Qannik’s odyssey began even before ConocoPhillips employees found her all alone this spring. Researchers first saw the cub emerge from a snow den, along with her mother and a sibling, in February. When she was spotted again in late April, she was on her own. An aerial search for the mother and sibling turned up no clues, so the decision was made to rescue the young bear. 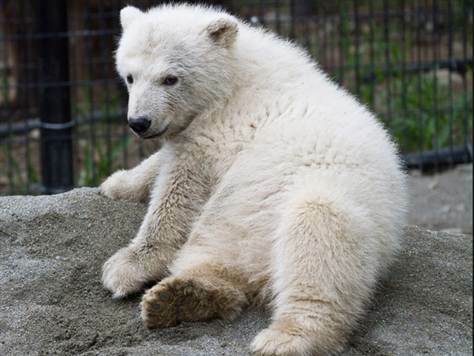 Qannik’s story is similar in some ways to that of Knut, a polar bear raised by zookeepers in Berlin, Germany, after he was rejected by his mother at birth. Knut became the zoo’s star attraction and an international celebrity before he died unexpectedly in March, drowning in his enclosure’s pool. Pathologists found that the bear had suffered a seizure due to encephalitis.